This tablet speaks for itself. Cretan pictograms dealing with the military and textiles/cloth are the last of the possibly/probably/definitely known pictograms out of a grand total of around 165, thus accounting for 31.5 % of all Cretan pictograms. So the number of possibly/probably/definitely known pictograms is significantly higher than had been previously thought. Of the military + textiles/cloth pictograms, 41. 42. 48. & 51. are definite, the remainder being probable/possible. The first two examples of so-called Cretan hieroglyphs appear to be 4 separate palm-leaf tablets, but are in fact one 4 sided-bar from Knossos. This is of great significance, because if I am right and the text is sequential, from start to finish, and runs dextrograde on each side (which it almost certainly does) then a clear pattern emerges. 5 distinct links are found on the four sides. These are clearly marked on the facsimile of this 4 sided bar (Knossos Hh (04) 03). Consequently, we can assume that this bar tallies contents, for which 5 key ideograms recur, signifying that there is a distinct coherence to the contents they tag. The four-sided bar appears to inventory not only agricultural items, namely, the produce of olive trees (olive oil) and some kind of grain crop, symbolized by the logogram which looks like the Linear A & B syllabogram ZU, but military ones as well. The ideogram for adze or labrys, which is the origin of the syllabogram A in Linear A and B, appears on face 1. Then we have what looks like a helmet on face 2 and a boar’s tusk helmet (L5) on face 4. (the latter the precursor, it would seem, of the Linear A & B syllabograms for E). Finally, we find an ideogram (L4) which looks like some kind of animal, and my bet is that it is a horse. All of these ideograms and logograms lend credence to a military interpretation. So I guess it is a cat. My decipherment is partial. The only candidate for Mycenaean derived vocabulary is the word uro = entire, whole, i.e. total, a synonym of kuro = reaching, attaining, i.e. total. The  word jaku obviously refers to the cargo. Is the Minoan Linear A labrys inscribed with I-DA-MA-TE in Minoan or in proto-Greek? PART A: Is it in the Minoan language? In my previous post on the Minoan Linear A labrys inscribed with I-DA-MA-TE, I postulated that the word Idamate was probably either the name of the king or of the high priestess (of the labyrinth?) to whom this labrys has been ritually dedicated. But in so doing I was taking the path of least resistance, by seeking out the two most simplistic decipherments which would be the least likely to prove troublesome or controversial. In retrospect, that was a cop-out. Since both of these decipherments make eminent sense, either could, at least theoretically, be correct. But there is a third alternative, and it is far more controversial and compelling than either of the first two. 3. It is even possible that the four syllabograms I DA MA & TE are in fact supersyllabograms, which is to say that each syllabogram is the first syllabogram, i.e. the first syllable of a word, presumably a Minoan word. 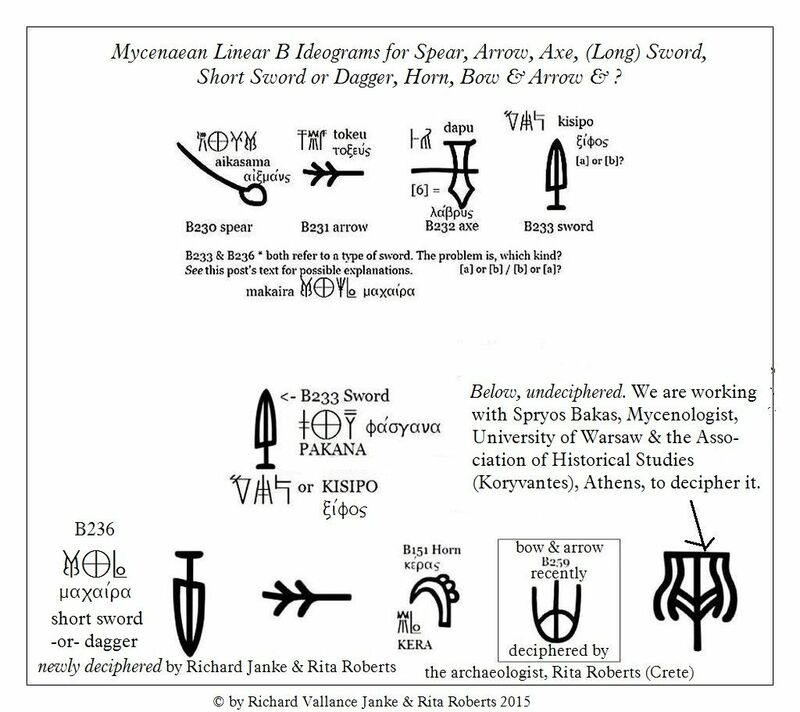 But if these 4 supersyllabograms represent four consecutive Minoan words, what on earth could these words possibly signify, in light of the fact that we know next to nothing about the Minoan language. It appears we are caught in an irresolvable Catch-22. But I cannot find any equivalent for MA other than maru, which seemingly means “wool”, even in Minoan Linear A, this being the apparent equivalent of Mycenaean Linear B mari or mare. The trouble is that this term (if that is what the third supersyllabogram in idamate stands in for) does not contextually mesh at all with any of the alternatives for the other three words symbolized by their respective supersyllabograms. 2. that all 3 of the supersyllabograms I DA & TE may instead stand for entirely different Minoan words, none of which I have managed to decipher. And God knows there are plenty of them! Since I have managed to decipher only 107 of 510 extant intact Minoan Linear A words by my arbitrary count, that leaves 403 or 79 % undeciphered! That is far too great a figure to be blithely brushed aside. to realize how blatantly obvious it is that any number of interpretations of any one of the selective cross-section of terms which I have listed here can be deemed the so-called actual term corresponding to the supersyllabogram which supposedly represents it. But, and I must emphatically stress my point, this is just a small cross-section of all of the terms in the Linear B Reverse Lexicon beginning with each of  the supersyllabograms I DA MA & TE in turn. It is grossly obvious that, if we allow for the enormous number of permutations and combinations to which the supersyllabograms I DA MA & TE must categorically be  subjected mathematically, it is quite out of the question to attempt any decipherment of these 4 supersyllabograms, I DA MA & TE, without taking context absolutely into consideration. And even in that eventuality, there is no guarantee whatsoever that any putative decipherment of each of these supersyllabograms (I DA MA & TE) in turn in the so-called Minoan language will actually hold water, since after all, a smaller, but still significant subset of an extremely large number of permutation and combinations must still remain incontestably in effect. The mathematics of the aforementioned equations simply stack up to a very substantial degree against any truly convincing decipherment of any single Minoan Linear A term, except for one small consideration (or as it turns out, not so small at all). As it so happens, and as we have posited in our first two alternative decipherments above, i.e. these two possible decipherments which do make sense can be extrapolated from the supersyllabograms I DA MA & TE, at least if we take into account the Minoan Linear A terms beginning with I DA & TE (excluding TE), which I have managed, albeit tentatively, to decipher. (b) the actual number of Minoan Linear A words I have deciphered to date rises from 107 to 108 (in a Boolean OR configuration, whereby we can add either  “Demeter” or “Mount Ida” to our Lexicon, but not both). A baby step this may be, but a step forward regardless. Minoan Linear A labrys inscribed with the word Idamate… what does it mean? Minoan Linear A labrys inscribed with the word Idamate... what does it mean? This brings the number of Minoan Linear A words deciphered more or less accurately to 66. The Mycenaean Linear B word turateu is very similar to the ancient Greek word. It is clear (at least to me) that such door guards, in this case 14 of them, would have been responsible for guarding the doors of sacred temples, such as the Hall of the Double Axes, Knossos (if it was one). I have added the genitive, temenoio, which means “of a temple” to indicate that these 14 are temple guards. Notice the double doors to the Hall of the Double Axes (double doors, double axes, probably intentional). These are the kinds of door that would have been  guarded at major ceremonies, such as for the King (wanaka) and the Queen (wanakasa). There isn’t much I can say about this tablet, apart from the fact that it inventories 6 double axes. The text on the left side is unintelligible, being left truncated. The importance of the labrys or double axe in the Minoan/Mycenaean religion cannot be over-stressed. This repetitive motif appears the whole length of the Hall of the Double Axes at Knossos – which I personally saw in May 2012 and which is a magnificent work of art. A nearly identical motif re-appears on frescoes at Mycenae. The presence of the labrys is all-pervasive in the Minoan/Mycenaean religious symbolism of the military. It is uncertain whether the religious or the military aspect predominates in such art, but I am inclined to say that it is the religious, since religious symbolism is rampant in the Minoan/Mycenaean pantheon. Moreover, their religion is primarily matriarchal, and not patriarchal. It is to be expected that religious mythology would trump military in matriarchal societies such as this. It is simply impossible to determine the meaning of the first word on this tablet, “tanopada”, left truncated, for which the previous syllabogram is probably “a”. In addition, there may be more than one syllabogram before the left truncation. Whatever the word it is, it appears not to be Greek. It may possibly be Minoan. As explained on the illustration of the tablet (above), it is also not possible to determine whether the number 3 refers to both the labrys and the small swords, in which case there would be 3 of each, or whether there is only 1 labrys and there are 3 small swords. My preference is for the latter. In addition, the mark following the number 3 cannot be 10, since the format for 13 is the reverse. It appears simply to a scratch. This unusual supersyllabogram appears on only 3 Linear B tablets from Knossos... unusual not only because it is rare, but also because it is either oncharged or supercharged onto the syllabogram for “double axe”. This would imply that the supersyllabogram DA is an associative, not attributive supersyllabogram, given that attributive supersyllabograms are otherwise without exception incharged in their ideograms. This leaves us in a bit of a quandary, because we should expect that DA is attributive and not associative. Its position (supercharged or oncharged) on this tablet and the other 2 like it indicates that it should be associative. But a double axe can neither be associated with itself nor be an attribute of itself. That is a contradiction in terms. So what are we to make of this bizarre positioning of the supersyllabogram DA onto the ideogram for the double axe? I can come up with no explanation other than that the supersyllabogram DA is neither attributive nor associative, but is simply itself per se. What is even more astonishing is the fact that the ideogram and the supersyllabogram are essentially one and the same thing. Was the scribe at a bit of a loss in his attempt to “describe” the double axe as a supersyllabogram? Actually, I don't think so. What he was doing in this particular instance was emphasizing or, if you like, stressing the fact that he was focused on the double axe. In this context, it appears that the ideogram for “double axe” coupled with its supersyllabogram must take precedence over the rest of the text on this tablet. The tablet is focused sharply on the inventory of the double axe, which takes precedence over any other consideration. At least that is my take on it. With the exception of the last one on the bottom right, these military ideograms speak for themselves. Mrs. Rita Roberts of Crete and I are of the opinion that her decipherment of B259 comes down to “bow and arrow”, in light of a Linear B seal inscribed with an archer wielding a bow and arrow she recently found on the internet and we posted here, which looks uncannily like the syllabogram itself. The very last ideogram (bottom right), with the arrow pointing at it, is as yet undeciphered. Mrs. Roberts, Spyros Bakas, in the graduate program for Mycenaean Studies at the University of Warsaw, the Association of Historical Studies (Koryvantes), Athens and I myself are all working together to find a solution for a tenable decipherment of this last ideogram. Should any one of you reading this post have any further suggestions for its decipherment, please feel free to leave a comment on this post.